Cacio e Pepe is a classic Roman dish. It's usually prepared with spaghetti, so when I bought my first spaghetti squash and was wondering what to do with it, I thought the vegetable would work nicely in place of pasta in that recipe. Kitchen experiments! As it turns out, spaghetti squash works quite well with a few modifications to the original recipe (real cacio e pepe omits the garlic and salt, and there's great debate as to whether butter belongs in the recipe). Since there are so few ingredients, use the best quality pepper and cheese that you can find - it makes a huge difference. Ground black pepper that's been sitting on the shelf for a year won't allow you to experience the full flavors of this dish. Preheat the oven to 350°F. 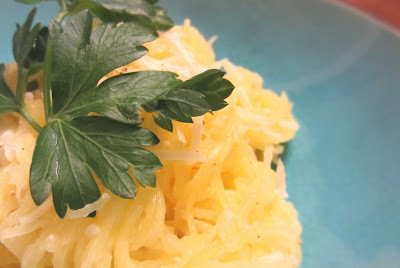 Microwave the spaghetti squash for 1 minute. Cut the squash in half lengthwise and remove the seeds and membranes. Place cut side down in a baking dish with water. Bake for 25 minutes or until the inside of the squash is fork tender. When the squash is cool enough to touch but still nicely warm, use a large fork to remove pasta-like strands. Combine with butter and garlic (the heat of the squash should melt the butter) in a medium-sized bowl and toss with salt, pepper and cheese. Serve warm.